Iridescence is a 3D-printed, Emotive Collar. The project was commissioned by the Museum of Science and Industry Chicago for a 15-month exhibition entitled “Wired to Wear” opening on March 21. 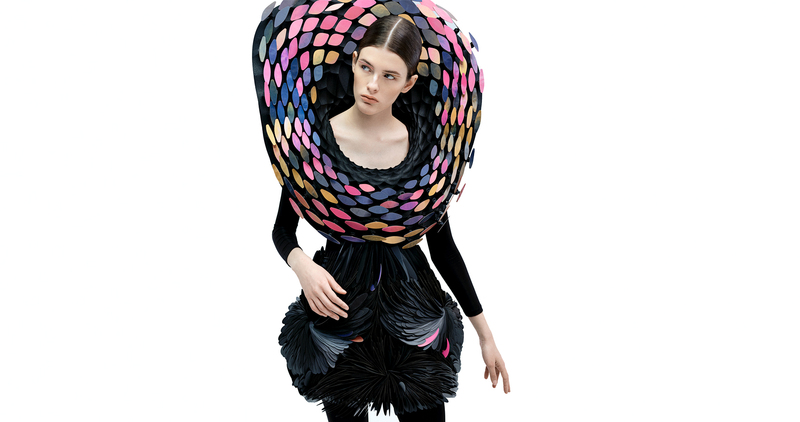 What if our clothing could sense the movement and emotions of those around us? How might technology expand our sensory experience and influence our social interactions? And in what ways could our clothing become a form of non-verbal communication, expressed through changes in color and texture? The hummingbird is a remarkable creature. The male Anna’s hummingbird , for example, has feathers around his throat that appear at one moment completely green. With a twist of his head, however, he can turn them into an iridescent pink. He does this by exploiting the capacity of the microscopic structure of the feather to refract light like a prism, so that the feathers take on different shimmering hues, when viewed from different angles. This is how the Anna’s hummingbird attracts mates during his spectacular displays of aerial courtship. 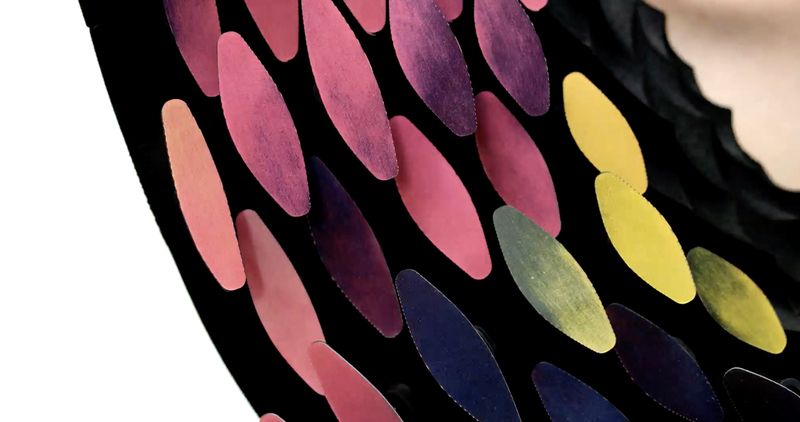 Iridescence is an interactive collar, inspired by the gorget of the Anna’s hummingbird. It is equipped with a facial tracking camera and an array of 200 rotating quills. The custom-made quills flip their colors and start to make patterns, in response to the movement of onlookers and their facial expressions. This project addresses a number of challenging technical issues. Firstly, the design and fabrication of color changing materials was informed by the logic of lenticular behavior. Not dissimilar to how light is refracted by the feathers of a hummingbird, Iridescence uses lenticular lenses laminated onto an array flat colored surfaces to provide color changing effects. Secondly, the rotation of the quills is controlled by a series of custom made electro-magnetic actuators, carefully designed to withstand the natural wear and tear of being part of an exhibition that lasts 15 months. These actuators can be easily removed and replaced by substitute actuators, if any of them fail. Another major engineering task has been to design a PCB driver boards to control and orchestrate the actuator's behavior. The goal is to explore how wearables can become not only a vehicle for self-expression, but also an extension of our sensory experience of the world. Although we might be blind or have our eyes closed, we could still sense not only where people are standing around us but also the emotions that they are expressing. Overall, this project is an attempt to explore the possibilities afforded by AI facial tracking technology and the dynamic behavior of a smart fashion item. The intention is to address psychosocial issues involving emotions and sensations, and to see how these technologies might inform social interaction.